Born: 16 July 1866, Halifax, Yorkshire, United Kingdom. 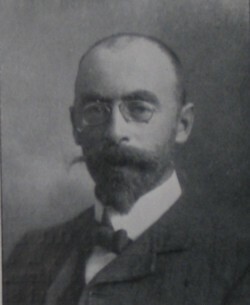 Ludwig H. (Louis) Wilms, electrical and mechanical engineer, was educated in Germany and subsequently worked for the Allgemeine Elektrizitaets-Gesellschaft (AEG) of Berlin for seven years. In about 1897 he came to the South African Republic (Transvaal) and became chief electrical engineer to Reunert & Lenz in Johannesburg until about 1904, when he took up a position as consulting electrical engineer to the East Rand Proprietary Mines (ERPM). Wilms inaugurated the electric driving of Cason and Angelo stamp batteries on the Witwatersrand. He was a member of both the (British) Institution of Civil Engineers and the Institution of Electrical Engineers. He was a member also of the South African Association of Engineers, and served on its council. In 1902 he became a foundation member of the South African Association for the Advancement of Science (his wife was also a member), served on the committee for Section C (which included engineering) for 1903/4, and was still a member by 1910. At the association's second annual congress, held in Johannesburg in 1904, he read a paper on "Lightning arresters for electric transmission lines" (Report, 1904, pp. 455-479). From 1900 to 1905 he was an examiner in electrical engineering for the final mining examination of the University of the Cape of Good Hope, and also served as an examiner for the Transvaal University College. Wilms was marred to Christiane H.F. Herke, but they were divorced in 1909. He later married Martha Wilder and moved to Croydon, England. They had a daughter, born in 1928, but Martha died soon afterwards. Wilms then married a young girl from Switzerland and settled in Zuerich for the rest of his life. Mooser, Ursula (granddaughter). Personal communication, 2018-11-22. National Automated Archival Information Retrieval System (NAAIRS). http://www.national.archives.gov.za/naairs.htm Documents relating to Wilms, Ludwig Hermann. University of the Cape of Good Hope. Calendar, 1899/1900, 1902/3, 1903/4, 1906/7.